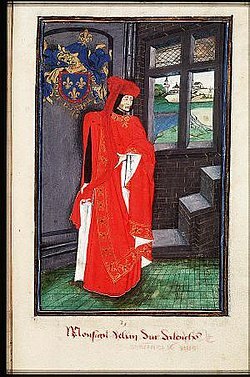 John II of Alençon (2 March 1409, Château d'Argentan – 8 September 1476, Paris) was the son of John I of Alençon and his wife Marie of Brittany, Lady of La Guerche (1391–1446), daughter of John V, Duke of Brittany and Joan of Navarre. He succeeded his father as Duke of Alençon and Count of Perche as a minor in 1415, after the latter's death at the Battle of Agincourt. He is best known as a general in the Last Phase of the Hundred Years' War and for his role as a comrade-in-arms of Joan of Arc, who called him "le beau duc" ("the fair duke"/"the gentle duke"). Coat of arms as Duke of Alençon. He saw action at the age of fifteen at the Battle of Verneuil on 17 August 1424, and was captured by the English. He was held prisoner until 1429 at Le Crotoy, paying 200,000 saluts d'or for his ransom. He sold all he possessed to the English, and his fief of Fougères to the Duke of Brittany. After Alençon's capture, the Duke of Bedford, regent of Henry VI, took control of his duchy. He would not regain Alençon until 1449, but remained the titular duke in the eyes of the French crown. When he left prison, Jean d'Alençon was called "the poorest man in France". Before his capture at Verneuil, he had married in 1424, at the Chateau de Blois, Jeanne of Valois, daughter of Charles, duc d'Orléans and Isabella of Valois, but she died in Angers in 1432, having given him no children. In April 1429, not long after his release, the duke heard about Joan of Arc, who had come to Charles VII at Chinon, promising to liberate France from the English, asking that he send her with an army to lift the Siege of Orléans. Alençon came eagerly to Chinon and very quickly became her good friend and most prominent supporter among the princes of the blood. After she raised the siege alongside Jean de Dunois and La Hire among others, Alençon arrived as official commander of the French army and played a major role in the liberation of the rest of the Loire Valley. He left to fight elsewhere after the end of the campaign in September 1429, preferring to attack the English around his own domains in Normandy. Upon Joan's martyrdom on 30 May 1431, when she was burnt at the stake by the English at Rouen, Alençon was one of the people most devastated by the loss. On 30 April 1437, at the Chateau L'Isle-Jourdain, he married Marie of Armagnac (c. 1420 – 25 July 1473, Cloister Mortagne-au-Perche), daughter of Jean IV of Armagnac. John was discontented with the Treaty of Arras, having hoped to make good his poverty through the spoliation of the Burgundians. He fell out with Charles VII, and took part in a revolt in 1439–40, (the Praguerie) but was forgiven, having been a lifelong friend of the king. He took part in the invasion of Normandy in 1449, but he had unwisely entered into correspondence with the English since 1440. (He had also accepted the Order of the Golden Fleece at this time.) Shortly after testifying at the "rehabilitation trial" of Joan of Arc in 1456, he was arrested by Jean de Dunois and imprisoned at Aigues-Mortes. In 1458, he was convicted of lèse-majesté and sentenced to death, but the sentence was commuted and he was imprisoned at Loches. He was released by Louis XI upon terms at his accession in 1461, but he refused to keep them and was imprisoned again. He was tried a second time before the Parlement of Paris and sentenced to death again on 18 July 1474, and his Duchy was confiscated. However, the sentence was not carried out, and he died in prison in the Louvre in 1476. ^ Walsby, Malcolm (2007). The Counts of Laval. Aldershot: Ashgate Publishing Company. pp. 184–185. ISBN 9780754658115.